Both North Dakota State basketball squads played host to rival North Dakota over the long weekend, and both Bison teams walked away winners in the first Summit League matchups between the two in-state schools. The Herd outlasted the Fighting Hawks Saturday, Jan. 19 in a 67-65 thriller. Early on, the game was all about momentum. UND shot out to a 15-3 lead before the Bison cut the deficit to four around 10 minutes in. The Hawks’ lead increased to nine before a 17-7 run put the Bison on top by one heading into the half. The second half was a back and forth battle, as the Hawks held a four-point advantage with five minutes to go. Bison junior and Sioux Falls native Deng Geu had a pair of clutch free throws and a dunk to tie it at 63. A quick bucket by UND’s Billy Brown put UND back on top, but the Bison never flinched. A Sam Griesel layup tied the game, and Geu hit the game winner with a little over a minute to play. Winning is always fun, but there’s always a little extra juice in a rivalry game. The win gave the Bison their third Summit League win, and UND dropped to 2-5 in Summit League play. The men’s squad has now won three of their last four and hope to keep their winning ways going as they head south to take on the Jackrabbits Jan. 24. Geu led all scorers with 15 points despite only playing 21 minutes, and Griesel was just one point shy of a double-double. Sophomore guard Marlon Steward led the Hawks with 14 despite a rough night shooting, going 3 for 16 from the floor. The NDSU women’s team completed the round one sweep of the Hawks on the night with a convincing 69-57 win. The two teams traded leads until late into the second quarter when a 12-3 Bison run put the Herd up 40-30. After the Hawks cut the lead to two early in the second half, a 3-pointer by Bison guard Michelle Gaislerova sparked a 7-0 NDSU run. The Hawks got within four with a few minutes left in the third, but that’s the closest they would come. Gaislerova led the way for the Herd, notching 17 points, just edging out Emily Dietz’s 16. The Bison stifled the Summit League’s leading scorer Lexi Klabo, holding her to just 11. One of the keys to the 12-point Bison win was points off turnovers. Nearly half the Herd’s points came off turnovers, while limiting UND’s points off turnovers to 11. Another key for the Bison was not forcing up shots. The Bison were an efficient 7 for 13 from beyond the arc, while the Hawks were only able to make two 3-pointers all night. The win snapped an eight-game losing streak to the Hawks and should provide some momentum for the Bison as league play begins to ramp up. 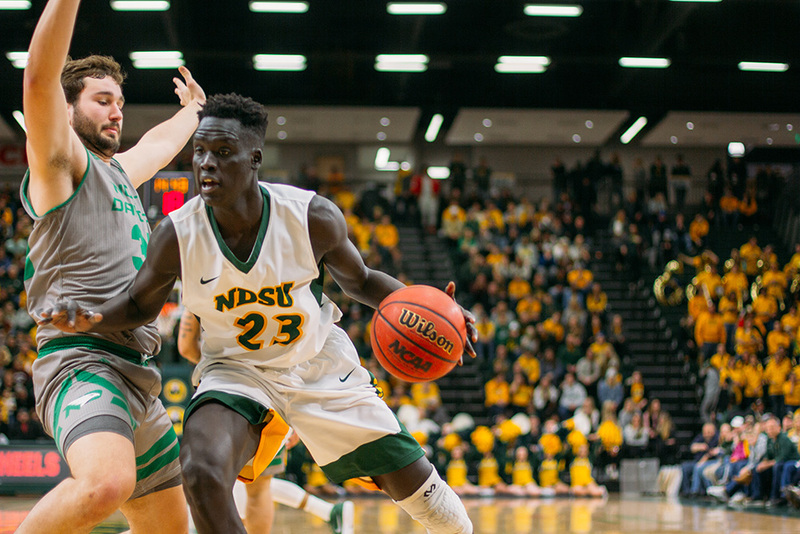 The Bison (6-12 overall, 3-4 in Summit League play) will now take on the Jackrabbits in South Dakota Jan. 23. The Rabbits are tied for first and offer a fun and interesting test for the Herd.